"syncline." YourDictionary, n.d. Web. 09 April 2019. 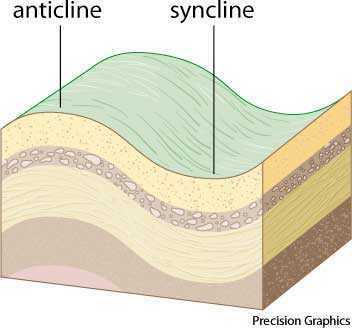 <https://www.yourdictionary.com/syncline>. A fold in rocks in which the rock layers dip inward from both sides toward a central line. A fold of rock layers that slope upward on both sides of a common low point. Synclines form when rocks are compressed by plate-tectonic forces. They can be as small as the side of a cliff or as large as an entire valley. Charniere anticlinale), the corresponding part of a syncline being the "trough-core" or "base," Y, fig. The group of heights of South Wales, running on the whole from west to east, marks the outcrops of the Old Red Sandstone and Carboniferous strata which lie within a vast syncline of the Silurian rocks.